The horned screamer (Anhima cornuta) belongs to the family of screamers, the Anhimidae. 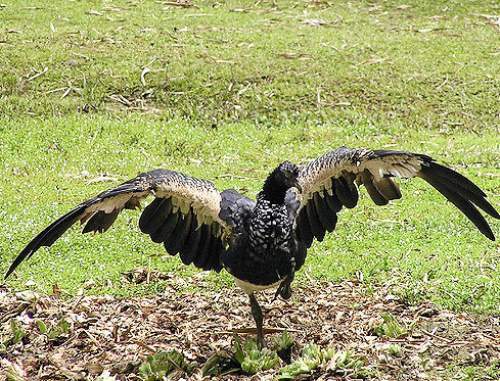 The horned screamer species is distributed in Bolivia, Colombia, Ecuador, Venezuela, Brazil, French Guiana, Guyana, Paraguay, Peru and Suriname. These screamer species are probably extinct in Trinidad and Tobago. These screamers are monotypic species. The horned screamer (Anhima cornuta) is a large screamer, measuring 80 to 95 cm in length and weighing 3000 to 3150 grams. The wingspan is 170 cm. The horned screamer has blackish upperparts, head and breast. There are whitish speckles on the crown, throat and wing coverts. The crown has a long spiny structure projecting out. This spine is a cornified structure, loosely attached to the skull. It grows continuously and may been seen broken at the tip. The belly, vent region and underwing coverts are whitish. The bill is short, dark gray and slightly bent downwards. The irises are pale yellow. The legs and feet are long and pale gray in color. The call of these species is a very loud, echoing goose-like sound. 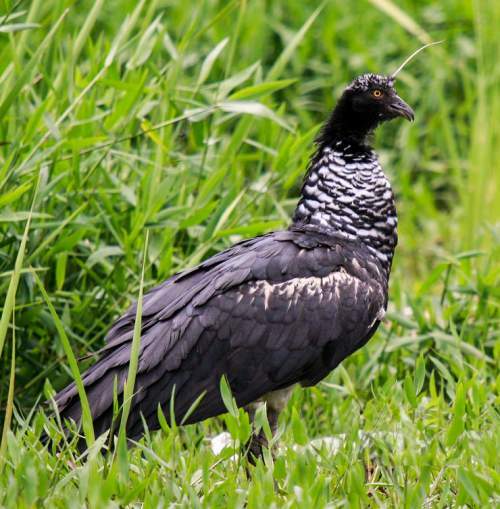 These horned screamer species are distributed in Bolivia, Colombia, Ecuador, Venezuela, Brazil, French Guiana, Guyana, Paraguay, Peru and Suriname. They are possibly extinct in Trinidad and Tobago. The Important Bird and Biodiversity Areas (IBA) of these screamer species in Venezuela is Reserva de Fauna Silvestre Ciénagas de Juan Manuel, Aguas Blancas y Aguas Negras. These horned screamer species have low forest dependence. They normally occur in altitudes from 0 to 800 meters. The natural ecosystems and habitats of these species include tropical and subtropical moist lowland forests, tropical and subtropical flooded grasslands, wetlands, marshes, swamps and peatlands. The diet of these horned screamer species consists mainly of plant matter. A variety of seeds of wild plants, flowers, stems and other plant material are their primary food. They forage on the floating vegetation. 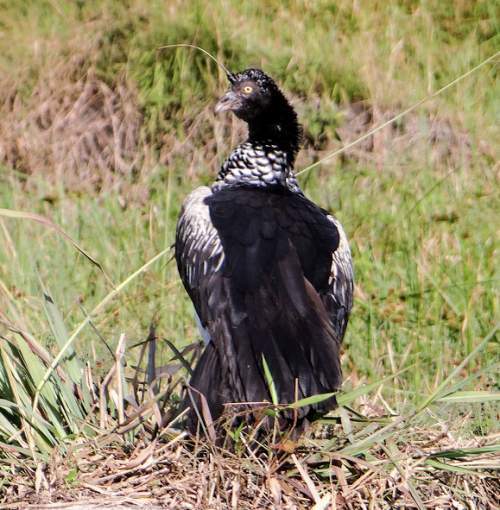 The breeding season of these horned screamer species appears to be prolonged. These species are monogamous and territorial. The nest is a pile of aquatic vegetation in the shallow waters. The clutch contains three olive brown eggs. Soon after hatching the chicks can run and swim. These screamer species are non-migratory resident birds. The global population size of the horned screamer (Anhima cornuta) has not been quantified. The overall population trend of the species is considered to be decreasing. In most of its range, this screamer species is reported as widespread and locally common. The generation length is 5 years. Its distribution size is about 12,300,000 sq.km. The horned screamer (Anhima cornuta) does not approach the thresholds for being Vulnerable, either under the range size criterion, or under the population trend criterion or under the population size criterion. The IUCN (International Union for Conservation of Nature) has categorized and evaluated the screamer species and has listed it as of "Least Concern". 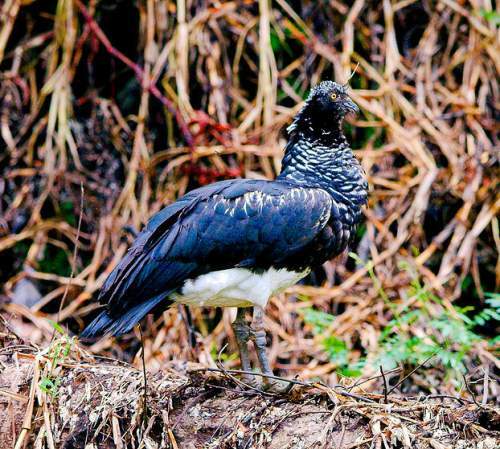 The CITES (Convention on International Trade in Endangered Species of Wild Fauna and Flora) status is ‘Not Evaluated’ for the horned screamer (Anhima cornuta). The horned screamer (Anhima cornuta) is related to the ducks, geese and swans. The horned screamer (Anhima cornuta) is closely related to the southern screamer (Chauna torquata) and the northern screamer (Chauna chavaria). Current topic on Birds of South America: Horned screamer - Anhima cornuta.